Meet Mr. Michael, a young realtor. Realizing that 80% of home buyers are searching online, he contacts a real estate website development company and entrusts its web developers with the task to create a website which is impressive and responsive externally, and equipped with an easy-to-use CMS or content management system internally. Soon after its launch, he starts getting a moderate traffic volume as well. He was happy that things would move forward. But to his disappointment that didn’t happen. Being puzzled, he returned to square one to his offline customer acquisition methodology. Don’t take this anecdote of Michel in isolation. In fact, it can happen and, in general, we can say it happens mostly, particularly with real estate entrepreneurs who don’t have much understanding of technology trends and insights. 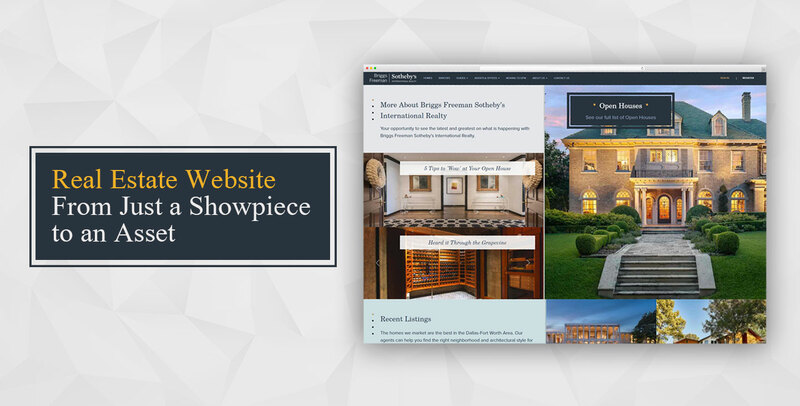 If your story is parallel to Michael, see what you need to do to transform your real estate website from just a showpiece to an asset. If your website takes more than 4 seconds to load, chances are you will lose almost 25% of your website visitors, according to a survey by Kissmetrics. It means, for every one second extra loading time, you are going to lose 6.25% of your visitors. And for every one-second delay in page response, your conversion takes a 7% hit. The story on a mobile platform is even more worrying as cellular data connections are not as fast as a broadband one. What are the factors? In general, people might suggest you cut down images or videos. This is one way, but not the only way. If your website loads slow, get it fixed by your real estate web developer. A better website structure, adherence to the Google’s webmaster guidelines and use of optimized themes and modules can make a big difference to the user experience. According to a Forrester report, 44% of online visitors before concluding a purchase like to interact with the business over chat. The human interaction instills in them a sense of trust and confidence. Consider integrating a suitable chat or chatbot API with your website to drive engagement. Obviously, chat integration may sound a cheaper alternative, but actually, it’s costlier than chatbot ones. Why? To manage a conversation with a chat API, you have to employ human resources, while a chatbot or talking bot can do it on their own. Leveraging the power of NLP (Neuro-Linguistic Programming), or machine-learning it can respond appropriately and in a less turnaround time. If you force web visitors to part away with their valuable information without delivering some values, it’s not fair. You are likely to witness an increased bounce rate (visitors returning from your webpage without any engagement or action) and bleak conversion prospect. Remember, the decision to buy a home or any other property is different from ordering a pizza or booking a flight ticket. Visitors would love to explore the minutest details of a residential or commercial project before filling your inquiry form. So, let them spend some time and do some research on your website on their own. Nothing will stop them from filling your inquiry form (to request quote/on-site visit/get a call back) once they have discovered authenticity in your business. A business website is not a Wikipedia, your UI-UX designers and real estate web developers need to understand it. Make users move step-by-step on your website towards the goal you intended. So, the content must be presented to the users in an organized way and proper sequence. For instance, it won’t be making any sense, if testimonials appear on the header banner of your website, or the information regarding a property for sales includes first-hand and resale houses in a haphazard manner. It will simply complicate the user-journey distracting their minds. It would be better to let users search property as per their interests based on location, area, budget, etc. You should take help of an MLS (Multiple-Listing Service) website developer to create a robust search tool. The leads obtained after narrowing down the user-journey is more relevant. Consider placing CTA (Call-to-Action) buttons at all suitable places on your website, for instance, on the service page, along with the listed-property, or on About page. Using an open form to collect information is also gaining traction in the industry. Adopt the minimalist concept regarding information that you ask for. Also, make the form-filling experience effortless. Use drop-down or auto-select option wherever possible. This will help mobile visitors to quickly submit a query, thereby, improving the lead generation rate. So, real estate website development is more like an art where different hues, design, and pattern have to be applied in a balanced manner to create an engaging user experience. Hence, you need to hire the right artist, i.e., real estate website developer, who can intelligently blend the technology resources and industry insights to create a user-oriented platform.